What if my phone is different to what I say? No problem. Giffgaff gives all phones a once-over when they arrive so they’ll send you an email with a revised quote for you to accept or reject. If you're not happy with the revised price, just let them know and they’ll send your phone back for free. It's based two things. The physical condition of your phone and how it's working. If your phone is dent free and everything works as it should then you're likely to get a great price. Easy. Just fill out the grading form on the page provided at Giffgaff, they’ll send you a prepaid postage pack for your phone, then pop on down to the post office to get a tracking number and send your phone. Get a price for your phone right away with the Giffgaff rating tool. Giffgaff will send you all the prepaid packaging you need, then all you have to do is pop in your phone and send it back. The team will give it a quick once over on arrival to ensure its quality is exactly how you’ve described, then you’ll get the cash. 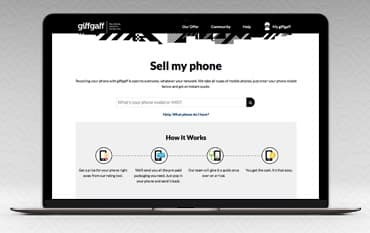 You will get paid for your recycled phone within one business day of your phone’s arrival and if you're not completely happy with the final price Giffgaff will return your phone for free. Popular phones that Giffgaff recycle include the Apple iPhone 6, the Apple iPhone 6S, the Samsung Galaxy S6, the Apple iPhone 5S and many more. You don’t need to be on the Giffgaff network to recycle your phone with them. The Giffgaff recycle service is open to everyone, all you have to do is enter your iPhone model or IMEI number into the toolbar on their website to discover how much your phone is worth. If you don’t know what model your phone is all you have to do is look under the phone’s battery or on the back of the phone. Most phones have the model number here. How do I send my phone to you? We will send you all the packaging you need to send your phone to us securely. Just take it to the post office and get a tracking number for it. How do you work out the value of my phone? The value is worked out on a few variables but bascically it's the physical condition of your phone and how well it;s working. So. if your phone is scratch and dent free and everything is working properly, you'll get the best possible price. Not long at all. Providing that your phone matches the description that you gave in our online grading tool, you'll be paid within 1 business day of your phone arriving in our warehouse. Recycling your phone with Giffgaff is open to everyone, whatever your network. Giffgaff takes all types of mobile phones, all you have to do is enter your phone model or IMEI number in the box provided on the Giffgaff website and get an instant quote. If your phone can’t be refurbished or you no longer want your phone then recycling is a great option- you get cash for your old phone and you’re helping protect the environment. Grade your phone online to see how much it’s worth in minutes and select a Giffgaff deal from us to keep costs low.